Do not park in the carpool lane any time between 7:15am and 8:15am. Instead, pull all the way up to the end of the diagonal lines and your child should exit the car on their own. We promise your child will find their way to the front door - they only have to walk down the sidewalk toward the front door. Please do not get out of your car while in the carpool lane. If you need to aid your child, kindly pull over to the parking spots provided. If you park on the street, please obey all state and city traffic laws. Please do not block resident driveways or use them to turn around. Send or walk your own kids to the crosswalks. The glare of the morning sun can keep drivers from seeing jaywalkers. Watch for kids crossing the street. Mind the crossing guard. He is protecting our kids. Pack your patience. If everyone obeys the rules, the process will be easier and safer for everyone. 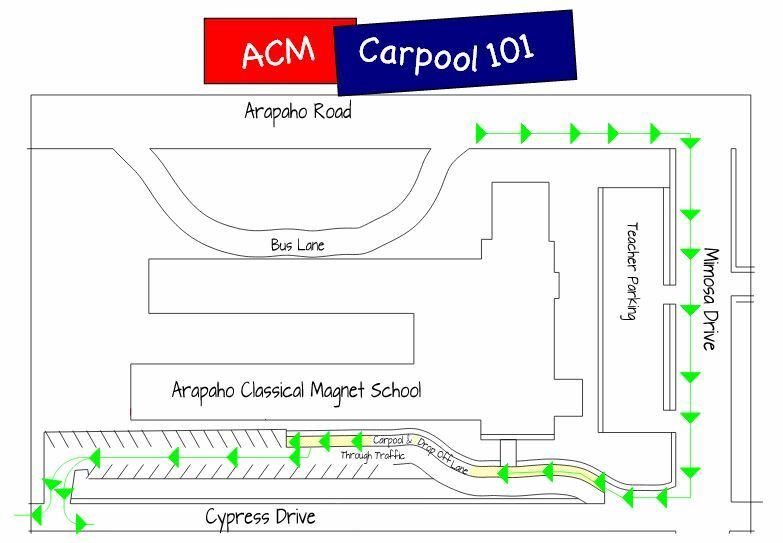 The carpool route starts Eastbound Arapaho; south onto Mimosa then West onto Cypress as indicated above in green. Do not enter the carpool line from Cypress or Northbound Mimosa. Not only do we have many students crossing the Mimosa/Cypress intersection, it is also unfair to those parents who have waited their turn. Please have your carpool number ready and displayed in your front window for K-3 students. Cross at the crosswalks only. Do not block the school driveways.